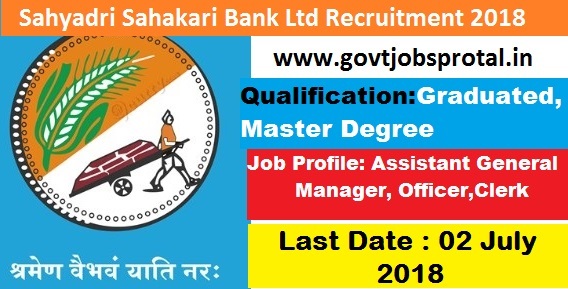 Sahyadri Sahakari Bank recruitment department is looking for the Assistant General Manager, Officer, Clerk posts. For that purpose the bank introduce a notification related to these bank jobs in India for various posts. All Indian candidates who satisfied educational and age criteria can apply these bank jobs in India through online process. This bank recruitment is for fresher candidate who passed in Graduation & MBA in Finance from a recognized my university with 50% Marks at least. Below in different section we explained this whole bank recruitment process, we advise you all to read all these sections carefully before applying. Education: Those who are wishing to apply these posts of Assistant Manager must have completed their Graduation at least with 50% Marks. While Post Graduates can also apply, but there is no minimum marks required for Post Graduate candidates. Preference will be given to those who have completed their MBA in Finance. Age Bond: Must have age in between 35 years to 45 years for applying these Government jobs. Education: Graduate candidates can apply these bank jobs but candidates must have 50% marks in the Graduation. For Post Graduate candidates there is no minimum marks limit. Age Bond: Applicants age must lies in between 30 years to 40 years for applying these bank jobs. Education: Graduation in any stream with 40% marks at least can apply for this post. Similar for Post graduates there is no minimum marks requirement in Post Graduation. Age Bond: Applicants who are wishing to apply for CLERK posts must have age in between 22 years to 35 years. What is the Application Fee for this bank recruitment? Candidates can pay through Demand Draft only. How we can apply for this Bank Vacancy 2018? What is the process for selection for these Bank jobs? Bank recruitment department clearly said that they will select the candidates on the basis of their performance in the written exam conducted by the bank itself. There will be written examination and after that personal interview round for final selection. 02 July 2018 Last Date for apply online.